So awful and sad that 3 orcas died young at Seaworld. 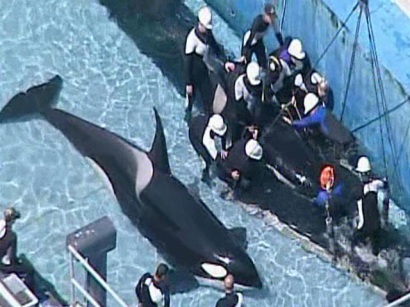 How many more have to suffer an early death before captivity is brought to an end? It is really astonishing that SeaWorld continues to claim the veterinary care and captive environment provided to their orcas is “the best in the world”, pretty low standards indeed. The detrimental effects of captivity is clear. Does SeaWorld care? Not yet. They still have enough “assets” to put on the shows but at the alarming rate in which these orcas are dying so young, it’s only a matter of time before the numbers diminish and they will be forced to look at alternatives. I only hope they don’t wait that long before making the right decision and do what’s best for those that still have a viable chance of survival… outside of the pools. The era of “circus” like attractions is over. Seaworld needs to realize that orcas and dolphins doing flips and trick is not educational, entertaining, nor acceptable anymore. I really do hope more negative publicity continues for Seaworld. The longer they are in the news (and not for the right reasons), the more aware the public will become. On the other hand, I wish that all their captive orcas will one day be free or in rehabilitation in a seapen.